If you or someone you know has suffered a head or brain injury, contact us now on 0800 0149565 for free, impartial advice about claiming compensation. Head and Brain Injuries can be internal as well as external. The damage can show externally leaving physical scars or where there is damage to the brain there can be memory problems, personality changes and impairment of everyday functions. These injuries can mean real changes in a family, causing issues with independence, affecting the ability to earn or work and impacting on relationships with a spouse, partner or children. TRUE Solicitors has a team of lawyers who specialise in head and brain injury claims. 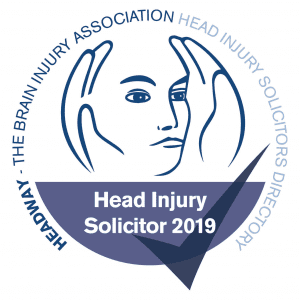 We are also one of Headway’s and the Brain Injury Group’s dedicated head injury solicitors in the North East. Our specialist lawyers will handle your case with compassion and care, providing you, and your family, with the support you need throughout the whole process. We handle all head and brain injury claims on a No Win, No Fee basis. What are the common causes of head and brain injuries? What are the common types of head and brain injury? • Concussion: A concussion is a temporary injury to the brain caused by high impact to the head. Symptoms of a concussion include vomiting, dizziness, headaches, memory loss, double vision and trouble with balancing. The cause of a concussion is usually due to an assault, a road traffic accident or a slip, trip of fall. • Skull Fracture: A skull fracture is any form of break to the cranial bone. Fractures are not always plain to see to the naked eye, symptoms that can indicate an internal fracture include bruising to the face, bleeding from the ears or nose and swelling and tenderness. Causation of skull fractures include; assault, road traffic accidents or injuring the head due to a fall. • Anoxic Brain Injury: This occurs when the brain is starved of oxygen for a period of time. The longer the brain is without oxygen the worse the long term effects will be. Short term symptoms can include dizziness or issues with concentration, to long term issues including permanent memory loss, and loss of vision, speech or movement. Anoxic brain injury can be caused due to carbon monoxide poisoning, head trauma, medical negligence and suffocation. • Diffuse Axonal Injury: Results due to the brain rapidly being moved inside the skull as the injury occurs. The rapid movement causes the connecting fibres in the brain (axons) to be sheared as the brain shifts inside the skull. DAI injuries can occur due to an assault, road traffic accident or fall. People effected by DAI can be left minor symptoms such as drowsiness and headache, to being left in a complete vegetative state. • Haematoma: Involves the collection of blood between the brain and the skull. It is typically caused by a form of severe head trauma following a road traffic accident or fall. Symptoms include headaches, drowsiness, vomiting and even loss of consciousness. What are the effects of head and brain injury? What can I claim compensation for if I have suffered due to a head or brain injury? • Provide you with jargon-free advice on whether you have a valid brain or head injury claim. • Agree to represent you on a ‘No Win, No Fee’ basis which means you pay nothing if you lose. • Arrange rehabilitation treatment that might help you to recover more quickly. • Obtain a medical report to assess the extent of your injury. • Recover any out of pocket expenses and future losses e.g. loss of earnings, travel expenses, medical expenses, property adaptations, care requirements. • Make sure you receive your maximum entitlement to compensation. We won’t settle for less. So if you or someone you know has suffered a head or brain injury, contact us now on 0344 854 7000 for free, impartial advice about claiming compensation. Head and brain injury cases are complex and often take years to settle. This is because it is important to properly assess the severity of the damage and the long term impact on the individual. For example, whether they are able to work again and, if so, at what capacity.